Welcome to our first ever interview episode! One of the things I love most about being a musician is getting to hang out with other great players and talk to them about what’s going on in their lives and careers. From here on out, I would like to bring you one or two conversations a month from people in the jazz and music world that I think are doing great things. 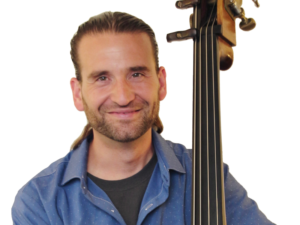 Jason Heath runs the Contrabass Conversations Podcast and is truly one of the nicest and most important people in the music world. He brings together so many people around his interview style show and this is something that you should all go and check out today. He has spoken with some of the most legendary jazz bassists on the planet and there is no substitute for hearing some of the wisdom that they have straight from the source. In this episode, I speak with Jason about what he’s currently doing in the industry, some of his favorite tools for being a better musician, and some of the educational materials that he uses with all of his students. I hope you enjoy this episode, please send me the names of anyone you would love to hear interviewed on the show! In the future I would also love to have some of our listeners on the show to talk about where they are in their journey and what they are doing to get to the next level. Drop me a line if you’re interested!